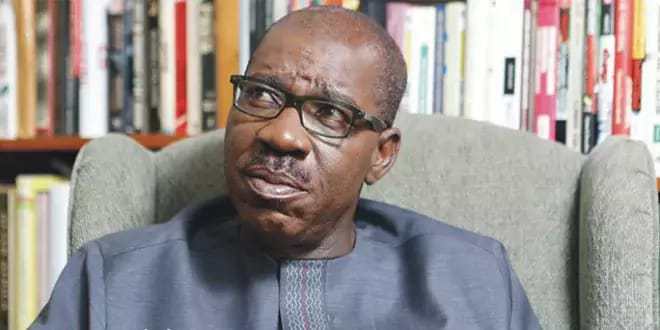 The Governor of Edo State, Mr Godwin Obaseki on Sunday pledged to transform the fortunes of the many ordinary people in the state as the state attained 26 years. In a speech to commemorate the anniversary of the state’s creation, Obaseki saluted the unalloyed support of Edo people to his administration in the collective match towards the lofty and attainable heights as envisioned by the founding fathers. “On this day, 26 years ago, our dear state was created with its people beaming with pride, high hopes and lofty dreams, excited about what had become a unique opportunity to take their collective destiny in their own hands. “From 1991 when this landmark event occurred till now, one leader after the other has taken the mantle, promising to deliver an egalitarian society where the interplay between state and its constituents produces a symphony of faith, trust and zeal to build,” Obaseki said. He further said that the APC led state government under his watch was consolidating on the gains of his predecessor and committed to creating a safe and secure environment for people to live, work and do business. “Our administration has sanitised land acquisition and ownership to the extent that today in Edo State, you can acquire a plot of land through the right means and build your house with all the necessary approvals without any fears of harassment by thugs. “Infrastructural development is a top priority for us as you must have seen ongoing road construction work across the state, which will be accelerated as the dry season approaches. We are revamping all our educational institutions and repositioning support structures such as media houses to deliver quality education to our people. “We promised to create jobs, and we have kept our word so far, and many more jobs are on the way. Healthcare, Rule of Law and other critical areas are receiving equal attention, and we are ready to intensify these efforts to deliver to you, the electorates, a new Edo State that we will all be proud of,” Obaseki said. He expressed his appreciation to the Royal Father, Omo N’ Oba N’ Edo, Uku Akpolokpolo, Oba Ewuare 11, the Oba of Benin, other leaders and elders as well as all Edo people who have kept the faith, volunteered wise counsels and showed understanding when tough decisions had to be made.